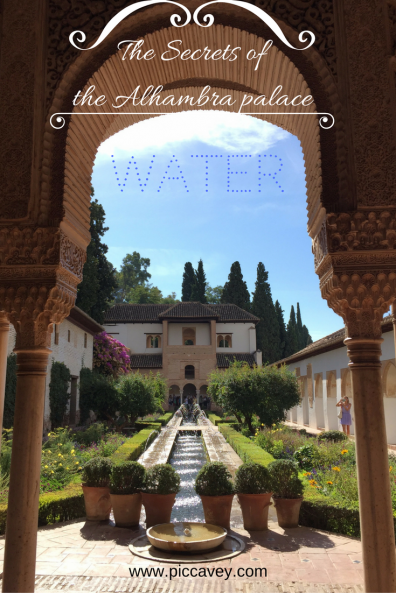 Can you imagine the Alhambra palace without water? It´s almost impossible to imagine this space without the fountains, pools and water features. Many of the decorative elements of this magnificent monument are created or enhanced with water. 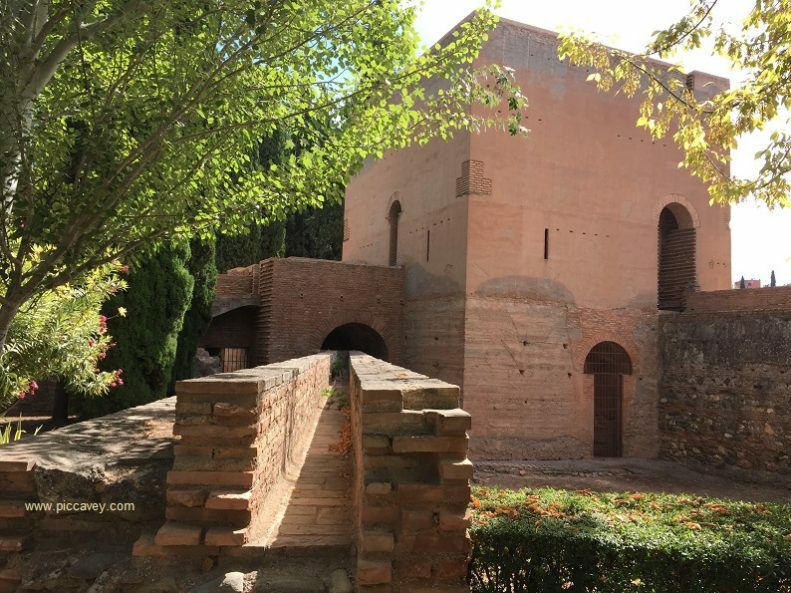 The use of water in the Alhambra palace changed the Sabika hill from a red dusty mound into a lush oasis. Construction in this area of the city is thought to have begun as far back as the 9th century. Around the 1360´s is when the palace as we know today really begins to develop. The Patio de los Leones or Courtyard of the Lions was built then. Now this is the most emblematic part of the Alhambra. This fountain is said to represent the heavenly garden of Islam. A large bowl sits on twelve lions; each one has its own individual markings and face. Underneath the base of Lion´s fountain run four water channels. These streams symbolize the four rivers of paradise. 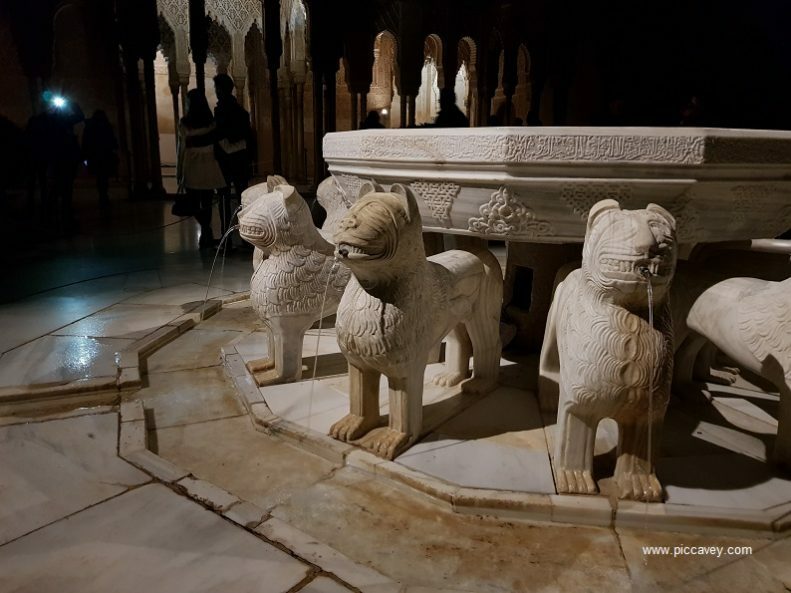 Each of the twelve lions spout water into channels below which run across the marble courtyard, creating movement and sounds across the centre of the palace. In 2010 a major restoration project helped to conserve the stone lions. Some of the stone and metal parts had rust stains after standing for so many years. This restoration work lasted more than a year. However it didn’t only allow for cleaning up the lions. This restoration revealed far more information about the water supply and engineering of the fountain than was first expected. This central feature had its own water channel. 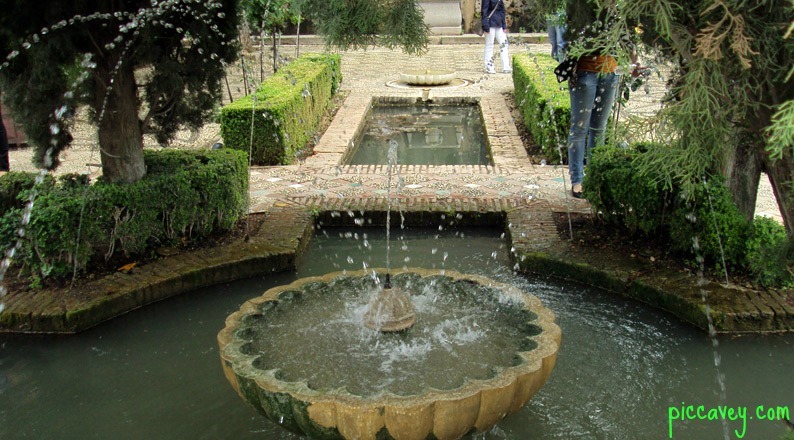 The water supply wasn´t from the same channels which gave water to the Alhambra gardens and fountains. This had its own exclusive channel which runs in parallel to the main channel from the acequia real. This is a bold and extravagant detail which helps us to understand the importance of the architecture in the Alhambra and the splendor the creators wanted to display. The patio of the lions is the centre of the Nazrid palace. The most beautiful part of the Alhambra palace. All rooms and corridors radiate from this central courtyard and fountain. So it was imperative that a constant supply of water arrived to this emblematic part of the palace. When you visit the monument you can see the Acequia Real if you lookout for it. Close to the the entrance to Alhambra Palace you can see one of the arched aqueducts. The design of this system ensured a constant flow of water, refreshing this palatial city. The builders made detailed calculations to use the natural flow of the Darro River. They created a pressure which would make the water flow naturally along its course. As well as the channels, several pools storing water, waterwheels and other devices made this system work. In 711 Arab settlers had already discovered roman water channels. The engineers for the Alhambra made use of this existing framework to create their own system. Expanding and improving what was already there. They built main channels and sub channels to create a large network. This system also encouraged agriculture in the area. It was working up until 1492 when the Catholic Kings took over Granada. They didn´t understand this system and it did not maintain it well. The Arabs carefully cleaned this water network each year to secure their clean drinking water. Next to the Puerta del Vino and the Torre de la Vela you come to a large open space known as the Plaza de los Aljibes. This means the square of the water tanks. Aljibes are large deposits for water storage. They are typical in Granada. Many of them are still in the Alhambra and Albaicin neighbourhoods. In 1494 the Count of Tendilla built a 34 metre long water tank under this square. Years ago there used to be a kiosk on the square which handed out glasses of drinking water from the underground cistern to thirsty visitors. Now there is a kiosk here but unfortunately just selling beer and ice cream. 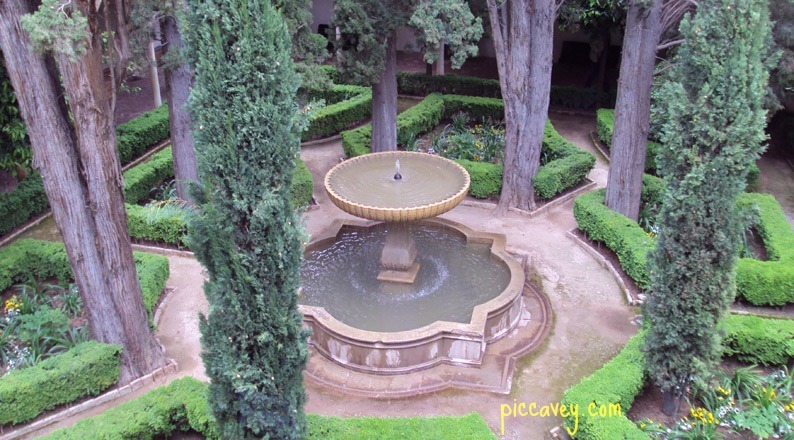 Patio de los Arrayanes or the court of the myrtles is a perfect example of the use of water in the Alhambra palace. This elongated pool seems to increase the size of the palace, by its captivating mirror effect. The grandeur of the palace is amplified by reflections of the intricate arches in the water. The babbling sounds of the small fountain at the end of the pool soothes the onlooker. The myrtle hedge around this pool releases a delicate scent when in flower. The architects considered the all five senses when designing these spaces. The Palacio del Partal is good example of this mirror effect on the water. The arches of the Partal façade reflect in the rectangular pool. 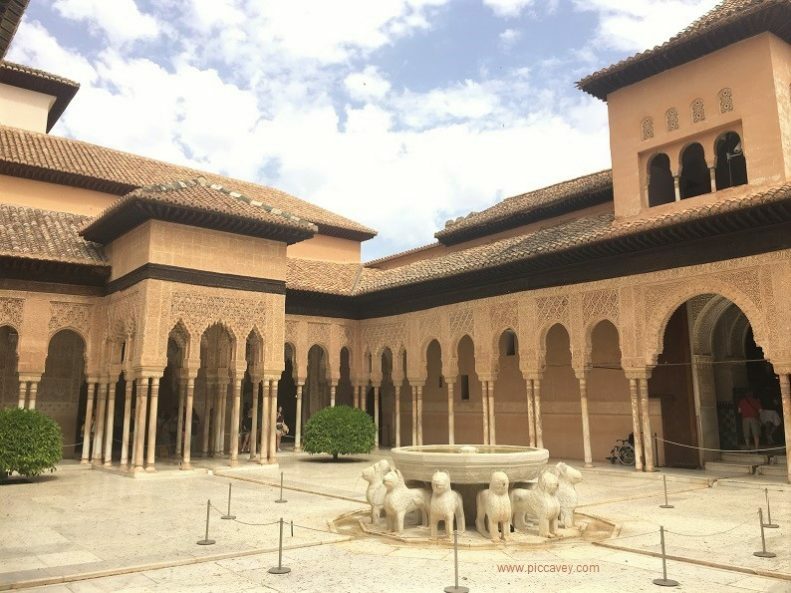 This palace dates from 1302 to 1309, it is the only one within the Alhambra which has remained almost unchanged since the Nazrid period. El Baño de Comares was called the Royal baths. This bathhouse used by the Catholic kings as their private bathing area in the 15th century. This is an excellent example of an original Hammam still here in the present day. This space is usually closed to visitors to protect its delicate interior. It is the only medieval Islamic bath fully intact in the western world. To see it on your visit to the Alhambra you can see parts of the building from a gallery corridor just outside. This corner of the Alhambra palace has fascinated many visitors over the years. It even inspired the painter Henri Matisse after his visit in the month of December in 1910. Several of his works were directly inspired by this place. The ceiling has star shaped openings in the ceiling. These holes are for regulating the temperature and steam inside the baths. Distributed in three rooms. The cold room, the warm room and the hot room. The importance of cleansing as a religious rite was not only an important part of daily life but a social activity too. This practise was later prohibited by the Catholic kings soon after their conquest. In 14th Century Granada there would have been many Arab bathhouses but sadly only a few examples remain. El bañuelo in Carrera del Darro is another example which you can still visit today. Now we come to the lush gardens of the Summer Palace, the Generalife. In Summertime the court would move to this cooler area of the Alhambra palace. Higher up that the Alhambra palace and set amongst the trees of the Alhambra woods. This summer palace has lots of open spaces, water features, lush gardens, ponds and long paths. 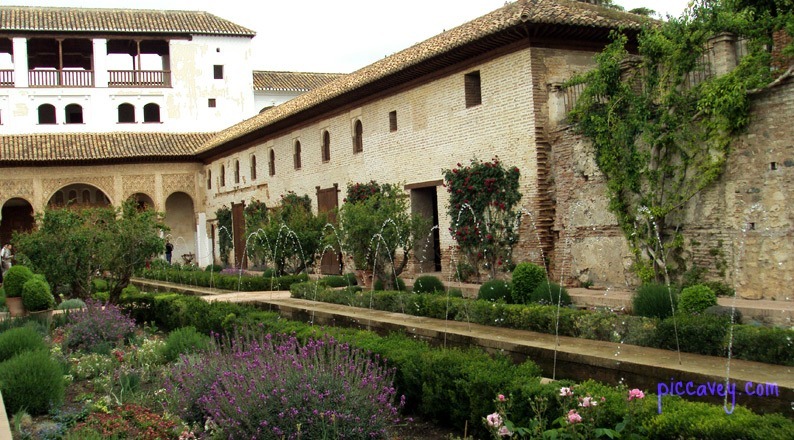 Probably the most well known sight in the Generalife is the Patio de la Acequia. Certainly the most photographed part of the Generalife gardens. Here you can see water shooting up forming silver arches above the plants and the rectangular pool. Similarly the large courtyard also offers views over the city of Granada on the left of this patio. 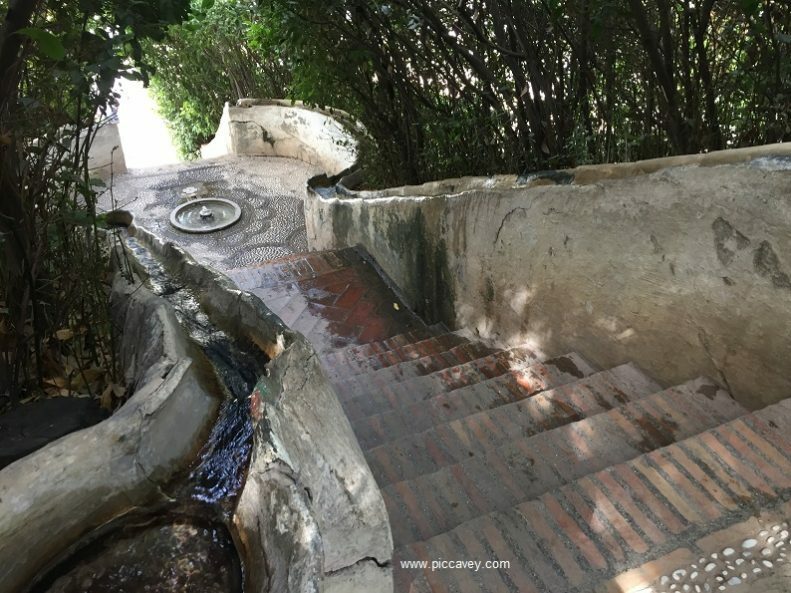 However my own personal highlight in the Generalife gardens is not this area but the Escalera de agua. Known as the water stairs this feature dates from the 16th century. It is a long staircase set amongst bushes and trees. It has water splashing down inside the hollow hand rail and is a unique and eyecatching sight. 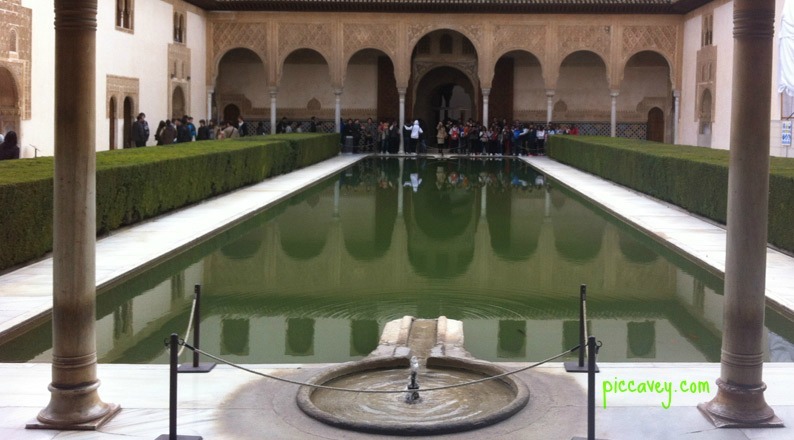 The architects of the Alhambra certainly knew how to use the abundance of water to reduce high summer temperatures. Also knowing how to amplify the prestige and power of the monarchs of the time. 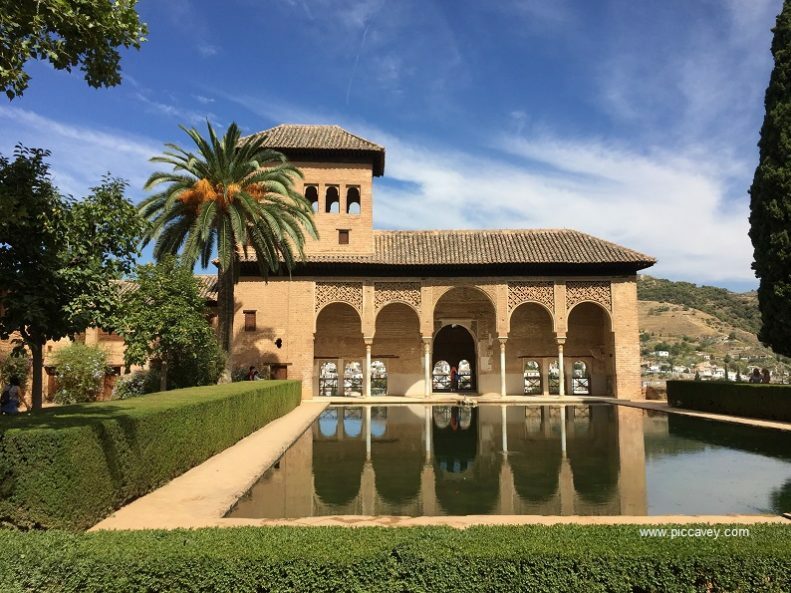 What was your highlight of the Alhambra palace? Yes, it seems that the more I read, the more there is to discover. The lions represent the twelve suns. When the Lions were being restored you could see them individually up close, and they are all quite different. When they are all together under the fountain it seems that they are all the same. Is it just me or is Nasrid the more common spelling? And aren’t most place names capitalized but season names in lowercase? I also think you should stay consistent with saying ‘River Darro’ or ‘Darro River’. Thank you for this article, though. Also, are they aljibes, aljbes, or alijbes? My sources say they are called aljibes, meaning cistern or well. 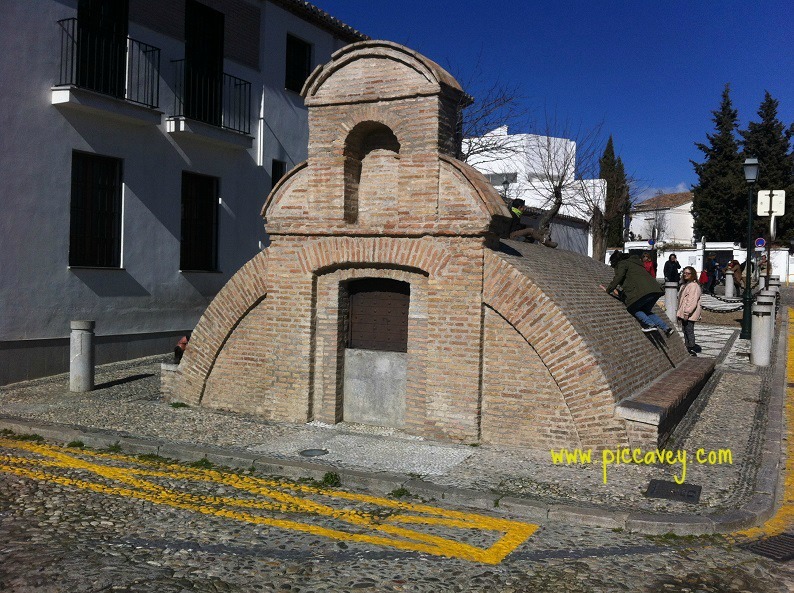 Hi, the spanish word for these cisterns is ALJIBE. I describe this as a tank to ensure everyone understands. It is a large deposit for water. I just visited the Alhambra and General Life last week. Our tour guide allowed us inside the baths and It was amazing that the early engineers were able to have water flow to all parts of the Alhambra. Quite a feat. Good story about an amazing place. Read a work of fiction claiming the lion fountain was a form of clock. Any truth to that? The fountain and its design is actually shrouded in mystery. There are several intepretations about the meaning of the lions. Some say that it is liked to Astrology and each lion is a zodiac sign. The clock theory is also possible as there are 12 lions and this would work like a sundial, indicating the 12 hours of the sacred calendar. Another idea is that the the fountain represents paradise, the source of life and the four rivers in the Koran. Whichever theory is correct, the fountain is clearly a show of power in the centre of the palace where the current monarch/sultan holds his court. Thrilled that you enjoyed your visit. I came across your blog from other travellers’ comments as I search for helpful info for my family’s upcoming trip to Spain. I bookmarked your blog because there’s just so much to read! So far, it has been such a delight to read through your narratives. 1. 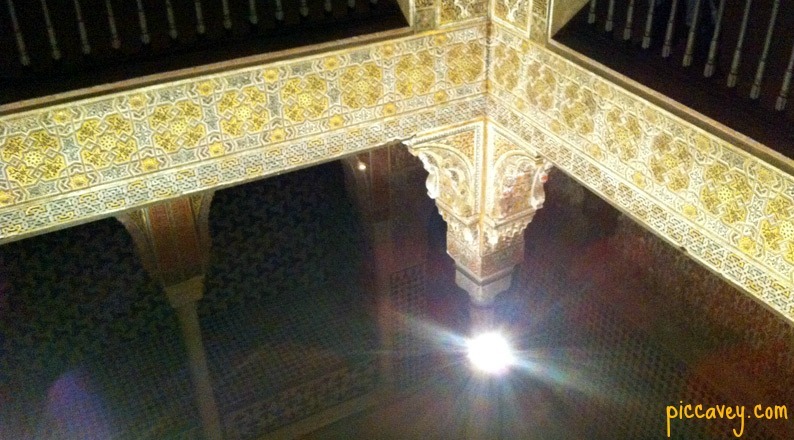 Do I need to book a guided, skip-the-line tour of Alhambra? A lot of people recommend this to save time but locals advise against it. My concern is that we might be limited by the 3-hour guided tour which might not leave us more time to o explore and take photos. But if this will save us time from queuing and waiting, I guess it’s worth it. 2. If so, which provider do you recommend? I’m confused with so many and I’m not sure how credible they are. Also, they offer different packages. With only one chance to visit Alhambra, I intend to see what needs to be visited. 3. Correct me if I’m wrong, I do need to find a tour that includes Alhambra – Alcazaba, Nasrid and Generalife, right? Would appreciate your advise. Thanks! It really depends how far ahead of your visit you are. If you have more than 30 days ahead of the day you want to visit then try the official website for the best option. If you are less than 25 days ahead of your visit you will probably have to book the guided tour.